Uh, what? The screenshot shows her combat as renowned. Isn't excellent the ranking below renowned? Has she decreased in ability? No, I was dumb and reading one of the Very Good lines as her combat stat and misremembering what I saw her combat stat as in the latest raid. That'll show me to say things about the game when I'm at work! We can sacrifice an absolute shitload of cows, and I suspect that the people saying "maximum cows" didn't anticipate the maximum being 247 cows. That's about a fifth of our entire cow herd! 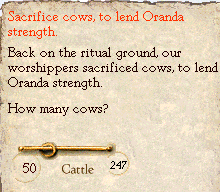 I go for a more sane sacrifice of 50 cows, with full acceptance of Oranda's blood being on my hands if she dies. We don't get to pick a second option here, but at least she won't be quite as prone to death now. Then the biting things come. There are the small biting things, who run circles around Oranda's children. 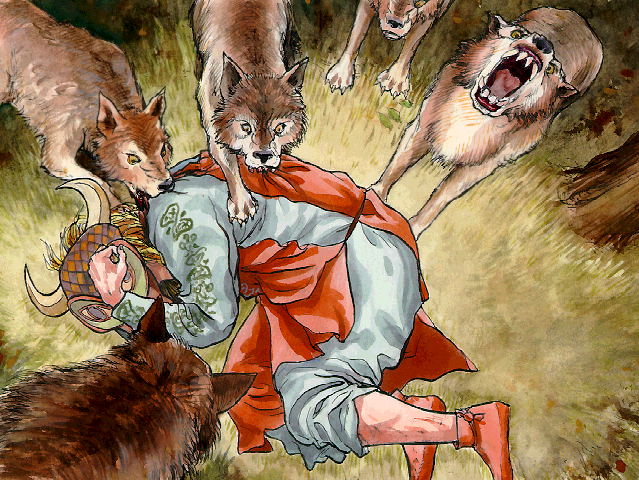 There are the large biting things, who jump out of gullies and from on top of rocks, who knock down the cows and tear out their throats. And there are all kinds of biting things in between. Oranda does not have the kind of magic that can stop this. So Oranda embarks on a journey to the tula of the two-legs. On the journey, Oranda is attacked by large biting things. -Drive off the biting things. The legends don't say much about this, so pick an option and hope Oranda doesn't die.